In a couple of days, Korea and many other Asian countries will be celebrating the Lunar New Year. 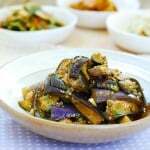 To help you prepare for the holiday feast, I previously posted 15 Korean New Year Dishes. 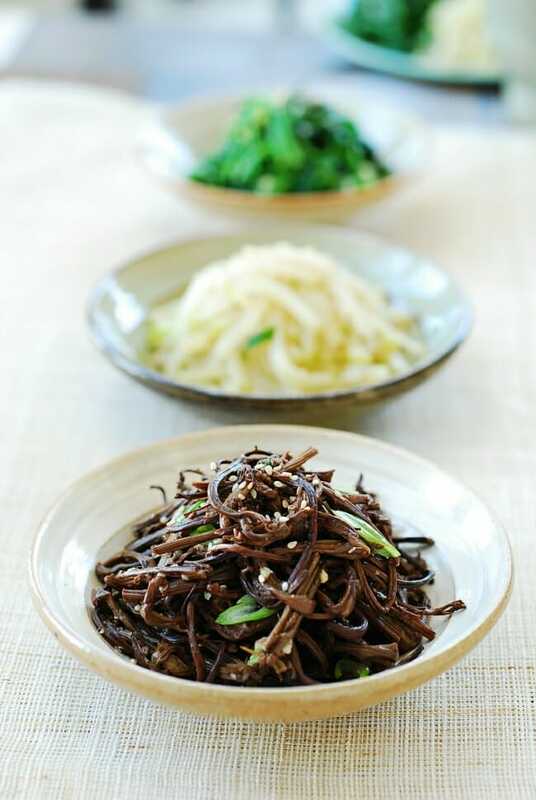 Here, I’m showing you how to make a side dish made with dried gosari (고사리, fiddlehead ferns or bracken). 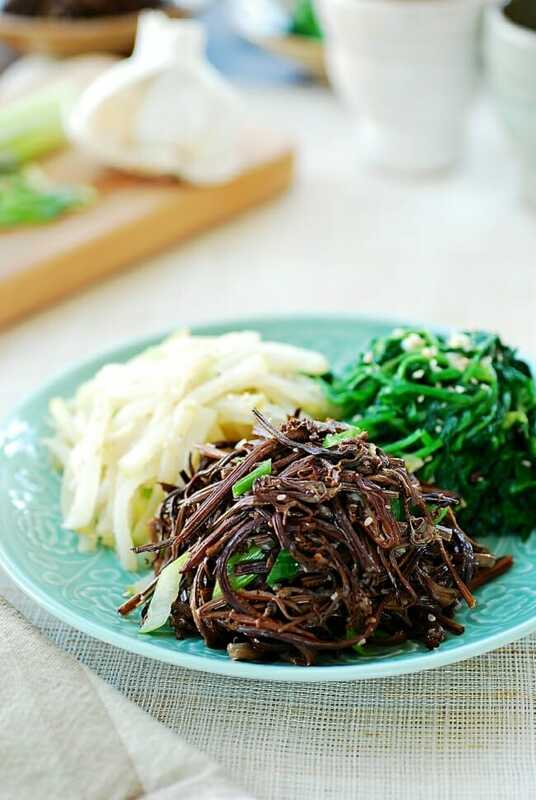 As I mentioned in my doraji (도라지, bellflower roots) namul post, a Korean traditional feast includes vegetable side dishes in three colors, collectively called (samsaek namul, 삼색 나물). Sam means three, and saek means color in Korean. 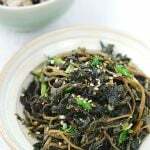 Typically, they are doraji (bellflower roots) for white, gosari (fiddlehead ferns) for black/brown, and siguemchi (시금치, spinach) for green. 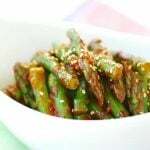 Other vegetables in similar colors can also be used. 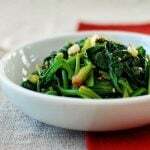 For the photos of this post, I used mu namul (Korean radish) for the white color instead of doraji. 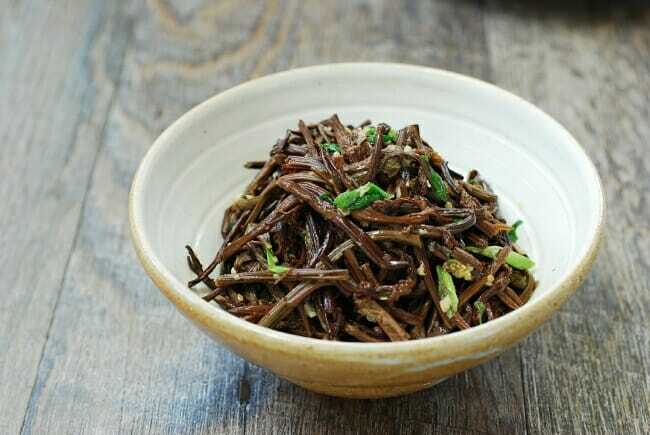 Stir-fried shiitake mushrooms are often used for the black/brown color as well. Gosari is the immature frond (known as fiddlehead) of a bracken (aka fernbrake) which grows in the hills and mountains. 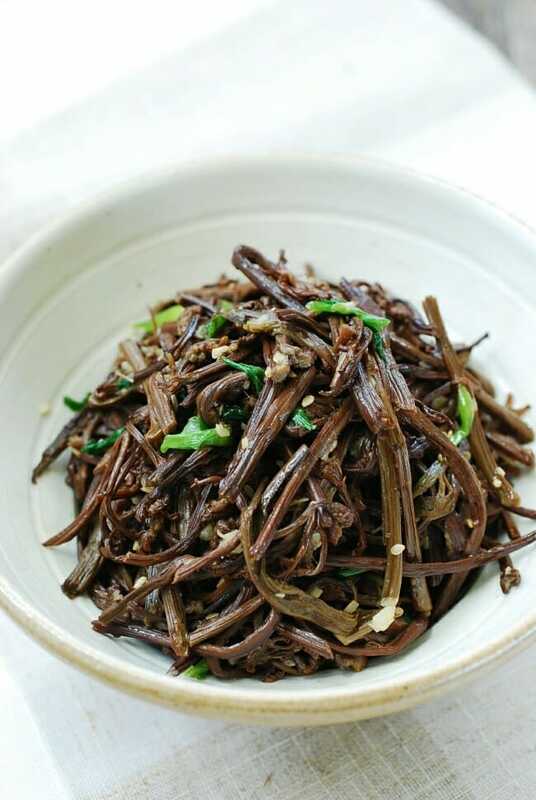 It has a deep, earthy flavor with a chewy texture, which makes it an essential addition to dishes such as bibimbap and yukgaejang. 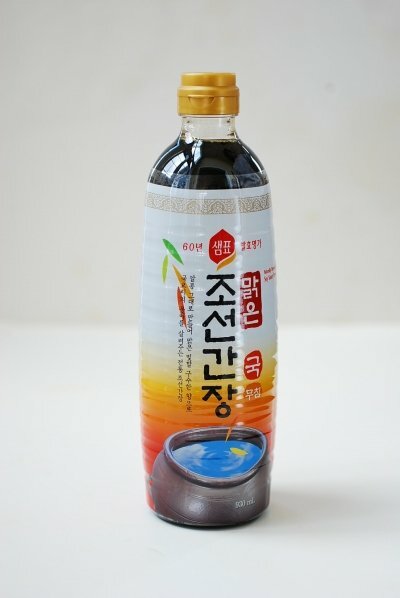 You can buy dried gosari (고사리) at any Korean market. Look for the ones with short, thin stems. 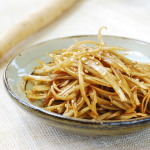 Lucky for me, I grew up eating quality gosari from Halla Mountain on Jeju Island (my parents’ hometown) which is known for the best gosari in Korea. We actually still get a constant supply from our relatives who pick the fiddleheads from Halla Mountain, when they are most tender, boil and dry for preserving. My parents and I have been happy recipients of the fruits of their labor for decades. Rehydrating gosari takes a combination of soaking and boiling. I find it quicker to boil first and then soak until it reaches the desired tenderness. The time can vary depending on the gosari. 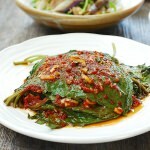 A Korean side dish made with dry fiddlehead ferns (gosari)! 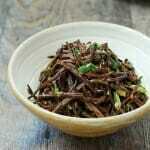 Add the gosari and 4 to 5 cups of water to a medium pot. Boil over medium heat, covered, until tender, 30 to 40 minutes. The time can vary depending on the gosari. Turn the heat off and let it cool in the cooking water. When ready to use, rinse in cold water and drain. Cut into 3 to 4-inch lengths, removing tough ends of the stems, if any. 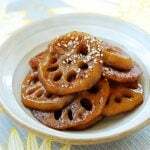 Mix the gosari with the soy sauce, sugar and garlic. Let stand for 10 minutes. 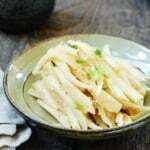 Sauté in a skillet with 1 tablespoon of vegetable/canola oil for about 4 to 5 minutes over medium heat. Pour in 1/4 cup of water (or dashima or beef broth). Cook for a few more minutes, stirring occasionally, until the liquid is almost gone. Add the scallion, sesame oil, and sesame seeds. Stir well before turning the heat off.